Chino, California – September 27th, 2011 - CM Storm, of the Cooler Master Group, unleashes a truly magnificent feat of engineering into an arena that represents the future of warfare; the Trooper full-tower chassis. Capable of lightning fast redeployment, it’s the first in its class to include an ultra-strong carrying handle; allowing a gamer to travel with the finest system configurations available with relative ease. CM Storm Trooper includes features that are most coveted by gaming enthusiasts in that it has full dust filter coverage, a fan controller, an external SSD drive hot-swap dock and two uniquely designed modular hard drive cages. 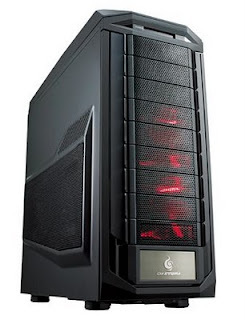 These features give CM Storm Trooper the ability to adapt to workstation or water-cooled gaming configurations easily. CM Storm Trooper exterior features a damage-resistant rubberized coating that will protect the case during transport. Things heat up as gaming becomes more intense. The included front panel connections and controls provide a user with the ability to make on-the-fly changes to fan speed and case LEDs while USB 3.0 and 2.0 ports, and audio connections are also provided as an added means of convenience. This is topped off by a 2.5” HDD/SSD X-dock that makes mounting extra drives as easy as loading a Blu-ray/DVD. Changing settings at a moment’s notice becomes a simple matter of a quick button press with CM Storm Trooper. CM Storm Trooper contains two modular HDD cages which can hold 4HDDs and a120mm fan for cooling each. These modular units can be rotated, front to back, side to side or removed altogether. CM Storm Trooper is the first chassis to allow fully modular hard drive configuration with no modification required. CM Storm Trooper can be equipped with multiple watercooling radiators. Creatively mounting a vertical water-cooling radiator is possible with the removal of the hard drive cages and panels. CM Storm Trooper has nine expansion slots providing support for multi-GPUs in SLI or Crossfire, space for up to 14 hard drives, and a motherboard tray that supports up to XL-ATX. The Trooper is an ideal mobile arsenal to house and transport the most advanced system and cooling setups. A professional cable management look is possible by utilizing the myriad cable tie zones and cable management holes available in the CM Storm Trooper. Smarter and larger placements of these areas allow for efficiently routing cables directly to their intended destinations. In an effort to reduce installation times, a great number of hardware can be mounted tool-free via the use of the included locking mechanisms or trays. A very large CPU heat sink retention hole has been placed in the motherboard tray to allow it to be compatible with most types of CPU and motherboard layouts. Prepare for the unexpected as seasoned operative would with a hidden drawer placed behind a false panel. The bottom panel removes to reveal a storage drawer to keep private effects safe from prying eyes until they are needed. CM Storm will be launching CM Storm Trooper at a MSRP of $189.99 in North America & South America. Expect to see it at retailers and online locations that sell your favorite Cooler Master, CM Storm, and Choiix gear by October 4th 2011 in North America & South America. Availability, and pricing will vary based on geographical region, please contact your local Cooler Master approved reseller or distributor in your country for more information. Through long-standing research programs, CM Storm is co-developed with the world's most prolific enthusiasts and eSport prodigies. Thanks to intensive testing and continuous feedback, the CM Storm division has been able to improve upon gamers' needs and find creative peripheral-based solutions to their tough to handle scenarios. Marking a new era for Cooler Master, our fierce Storm Gear stands ready to mobilize and provide backup throughout your digital conquests. For more information, please visit www.cmstorm.com.